Thanks FORTUNE GOURMET for bringing your wonderful, sustainable and seasonal products to Baconfest Chicago 2015! At Fortune Gourmet, we are obsessed with flavors, textures, fragrances, and the pleasures of food. We care deeply about sourcing the best-tasting products available for our customers. Our experience has shown us that the most delicious products often come from smaller farms and artisans. We are commited to hand-selecting these outstanding foods and matching them with the nations leading chefs and retailers. 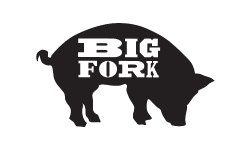 Baconfest Chicago is please to welcome our good friends from BIG FORK back on April 17th and 18th. They make bacon sausage!!! Need. We. Say. More? AWESOME!